My fellow Lost Girls and I have been busy plugging away at writing the book all summer long, so we haven’t been getting out as much as we used to. Heck, after a few days spent cuddled up with my computer, I consider just going to an evening yoga class a big night out. And while it tends to be naturally quieter this time of year with many New Yorkers migrating to less humid locales, such as the Hamptons, there’s still plenty of writing distractions happening in the city that never sleeps. Here are three urban experiences for when you can’t get to the beach during the dog days. Have fun for a cause. My friend Meg and I discovered a whole new singles scene that exists outside the traditional pub-filled stomping grounds: charity events. It may sound strange, but there seems to be a huge community of singles who prefer to spend their entertainment dollars on worthy causes than to burn through their wallets on over-priced martinis at a fancy bar. You can log onto sites such as charitybenefits.com or charityhappenings.org to find events that interest you and causes that you care about. 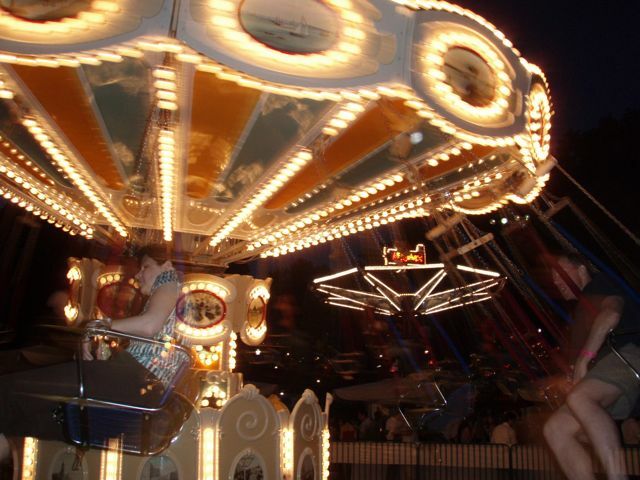 Meg and I attended the Ultimate Summertime Party at Central Park’s outdoor amusement park at Wollman Rink, put on by the National Multiple Sclerosis Society. 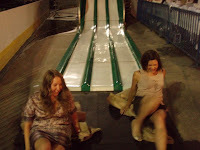 The $75 we paid for a ticket went to help fund education and research for the disease, and we got to act like kids again by playing carnival games, eating fried food, and jumping on rides (how dare I go down a slide in a skirt?!). Take me out to the ball game. 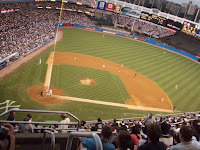 I’ve committed the ultimate crime in the eyes of many baseball fans: I’ve lived in New York for more than six years and had never been to a Yankees game. Since this was the final season to see our team play in the old stadium before they christen the new one, my friend Matt somehow hooked us up with tickets to watch the Yankees play the LA Angels. Though I know next to nothing about baseball, I couldn’t help but cheer along with the crowd as the bleachers shook and vibrated from fans stomping their feet. But I suspect Matty may have regretted his decision to bring me along when die-hard Yankees fans dressed head-to-toe in attire decorated with their team’s logo threw me menacing looks after I stood up to yell wildly when the teams switched places on the field. “Hol, you’re cheering from the wrong team,” he’d leaned over and whispered in my ear, no doubt a little nervous that the group of inebriated men seated behind us might retaliate. We both came out okay, but our team didn’t: The Yankees lost 0 to 1. Sip and sail. Sailing past the Statue of Liberty at sunset is a welcome relief from the steamy heat rising off the smoldering concrete-well, as long as you don’t get seasick! 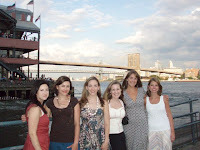 For Amanda’s fabulous 30th birthday celebration (which actually lasted an entire month with the myriad of dinners, lunches, and parties we had planned for the youngest Lost Girl), we embarked on a 40-person sailboat around the tip of the island we call home. More upscale than the popular booze cruises, we nibbled on foccacio and tasted various Italian wines as the crew did all the heavy lifting. And nary a one of us got seasick-though we might have felt a little queasy from overdosing on the birthday cupcakes we smuggled onboard. Great!!! I see that you spent great time together! What about travelling abroad? It’s funny: the dog days are really exist? Do you like to play beach volleyball? As for me, it’s cool and funny to do it in a company of boys:))) Very nice holidays! Good Luck! Great post and great charity links. What great causes and opportunities, especially for singles. Great advice! Can I suggest a new site I just found http://itrulycare.com they offer free cause & charity event postings, completely locality based, and social sharing to get the best awareness.